Ultimate Apartments Bondi Beach is a Bondi Beach property, offering executive quality apartment accommodation, at the best price on the beach. Conveniently located in the central Bondi village and within a short stroll of Sydney's ultimate beach, Ultimate Apartments is perfect for any type of stay. We have 45 fully furnished studio apartments catering to couples, singles and families who wish to stay for short or longer terms. 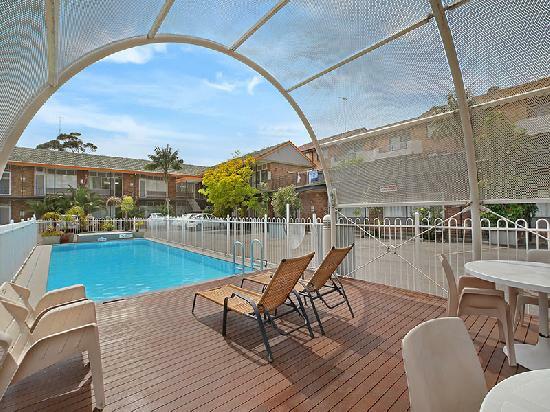 The Ultimate Apartments Bondi Beach is close to everything that Sydney has to offer and features numerous guests facilities including direct internet access, faxing facilities, free car parking, guest laundry, outdoor swimming pool and baby cots available. We have 45 fully furnished studio apartments that can cater for couples, singles and families with public transport at our doorstep!The facilities at the Ultimate Apartments Bondi Beach include:Fully furnished studios with weekly cleaning and linen service. Free off street security parking. Free lock-up storage. Free Foxtel satellite TV in every apartment. Swimming pool and sun deck. Coin laundry and clothes line facilities. 24 hour access and security door entry for each apartment. Nearby Attractions : The beautiful and world famous Bondi Beach, the equally beautiful Coogee Beach, local restaurants, bars and nightlife on the Bondi Village are close by. Family Studio Apartment : Sleeps up to 4 guests on 1 Queen & 1 Single Bed + Sofa Bed Extra. Queen Studio Apartment : Sleeps up to 2 guests on 1 Queen Bed. Twin Studio Apartment : Sleeps up to 2 guests on 2 Single Beds.